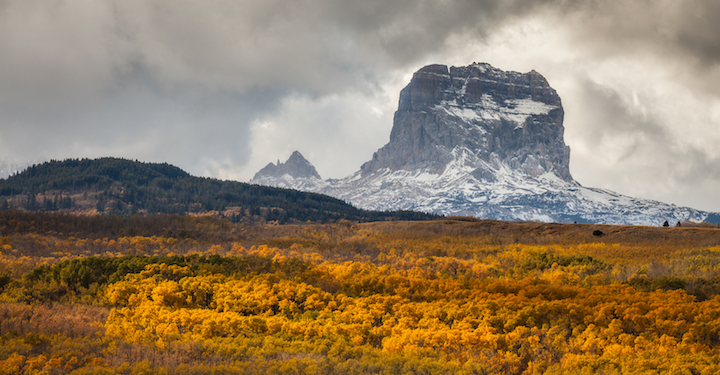 Ask anyone who has lived in Montana for a while what their favorite season is, and we’d guess that you’ll get “fall” as the resounding answer. The cooling air, the vibrant colors and the ability to enjoy the sights without crowds of tourists are just a few reasons everyone loves the fall. Tucked away in the northwest corner of Montana, the Flathead Valley lies between Glacier National Park and Flathead Lake. Flathead Valley is home to Kalispell, the largest city in the area, as well as Whitefish, Columbia Falls and Bigfork. Known as the gateway to Glacier National Park – a park so magnificent it’s actually called “the Crown Jewel of the Continent” – you’re sure to find plenty of things to do in the Flathead Valley throughout the year. However, the fall season is undoubtedly the most glorious time to enjoy all the region has to offer. Head to Glacier National Park. Visiting Glacier National Park is the obvious first choice for any fall enthusiast. The colors along the Going-to-the-Sun Road (open until October 16) are absolutely stunning! Ride your bike or hike along any of the trails in the one-million-acre park to view the amazing shades of autumn, bright blue skies and plenty of wildlife. Tour the Blackfeet Trail. Blackfeet Nation is located on the east side of Glacier National Park and offers beautiful sights along the Rocky Mountain Front. Take a self-guided or a guided tour along the Blackfeet Trail, defined by historic roadside markers and learn more about the Blackfeet people and how the Great Plains existed in former days. Explore German heritage at the Oktoberfest. One of the best events in the Flathead Valley during fall is the Great Northwest Oktoberfest, held in Whitefish at Depot Park. For just a five-dollar admission fee, you can try a variety of German beer and food, plus enjoy live entertainment and crazy contests like keg hurling and stein holding. Try to complete the Fritz Corn Maze. The Fritz Corn Maze has been growing since 2007, which means it’s only getting bigger and bigger – and harder to complete – with each passing year. Along with navigating through the corn maze, your family will also enjoy sack races, a hillbilly scavenger hunt and pumpkin slingshot. Part of the proceeds this year will go to the victims of the wildfires in Montana, too. Visit Sweet Pickin’s Pumpkin Patch. Grab the whole family and head to Sweet Pickin’ for a day of adventure and play. Kids will love the giant jumping pillow, carnival rides, tractor tour, and of course, the kettle corn and hand-dipped caramel apples. Enjoy some of the best fall foliage tours. Fall colors hit their peak in early October in Montana, so make your fall foliage tour plans now! Besides Glacier National Park, you can also consider driving along Highway 2 between West Glacier and Browning, where you’ll be surrounded by wilderness and mountainous terrain. Flathead National Forest also provides plenty of opportunities for viewing more amazing fall color, like the hiking trails along Strawberry Lake. Enjoy all the Flathead Valley has to offer and live life to the fullest at Immanuel Lutheran Communities, offering vibrant senior living in Kalispell. From gracious, comfortable independent living options to the assistance you need with daily activities, you’ll feel right at home with our staff that treats you like family. Contact us today to schedule a personal tour.